The meeting house at Jamesport, now over 286 years old, is the oldest public or religious structure on the East End of Long Island. However, its history has by no means been smooth and uneventful. Instead, this remarkable survivor, built the year before George Washington was born, has witnessed all sorts of controversy and dissension. Its members have struggled with membership and finances; they have argued and split over theological issues difficult to fathom today; and several times the church fell on really hard times – but remarkably, each time it was resurrected, and again came to play an important role in the lives of the communities it served. Its closest brush with disaster came in 1900 when lighting struck the then-95 foot tall steeple. Without a fire department next door, community members had to climb up above the Civil War era bell and chop off the top of the tower while it was in flames over their head. When they rebuilt, the steeple was 30 feet shorter! Along the way, the building has hosted congregations that were Puritan, Presbyterian, Congregational, Baptist and Unitarian. Its first minister, Nathaniel Mather, was a scion of the famous Mather family of ministers in New England. The Meeting House is was where Lyman Beecher preached one of his most famous sermons in 1806 calling for the abolition of dueling – just after the death of Alexander Hamilton. And, perhaps even more significant, this sermon proposing the formation of societies to advocate the abolition of dueling was widely circulated as a pamphlet and helped end the practice of dueling in the United States. Moreover, its proposed methods became a model for the campaign for the abolition of slavery a couple of decades later. 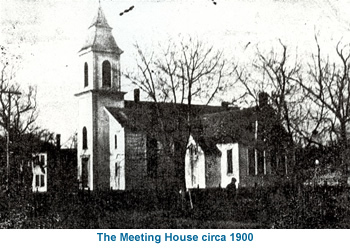 The Meeting House has also hosted numerous civic meetings, concerts and other community events. Although most of the colonial-period exterior and interior was altered in the 1859 rebuilding, there are several locations where the post-and-beam framing can still be viewed attesting to its original medieval look with exposed half-timbering and internal braces on the interior..
And, now the community has come together again to save this venerable building – just as it did in 1731 to build it. In the early 21st century, when First Parish Church put the historic structure on the market as “commercial real estate,” it came close to becoming a pizza parlor, art gallery or Starbucks. However, community members formed a Preservation Trust, obtained financing from the community to purchase the building and closed on the transaction in 2008. Since then, community members have donated their time and resources to make restoration of the building possible and community businesses have donated equipment, labor, expertise and professional services. The link and correlation with the past has been established once again as the meeting house emerges with and important role in the community. Church bells toll once more for weddings and on Sundays in the simple, freshly painted sanctuary. Music and flowers regularly fill the space. There are concerts and lectures. There are meetings and gatherings for youth groups and for community projects. The meeting house truly has been resurrected yet another time, 300 years since its beginning. It gives one pause to reflect.